Ethiopian Airlines: The airline that turns miles into smiles. While Ethiopia as a country has preserved many of its ancient traditions that include unique religious music, monastic traditions and colorful seasonal rituals, the country's air carrier, Ethiopian Airlines, has not only managed to preserve the country's hospitable culture for the last 60 years, but has also embraced modern aero technology to turn flying many miles into many smiles. 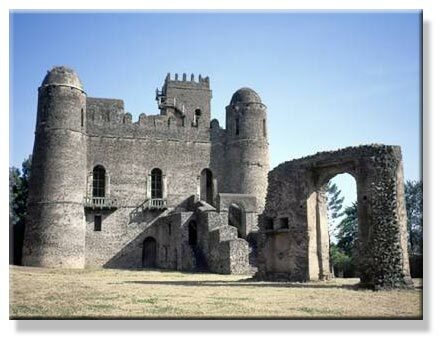 Fasilides' Castle in Gondar, Amhara Region by Dawit Rezene. Ethiopian Airlines which started with a single old aircraft in 1946 had by the late 1950s started modernizing. The humble beginnings, according to Ethiopian Airlines' area manager for Uganda, Ermejachew Regassa, helped make Ethiopian Airlines what it is today. The airline now operates a modern fleet of 30 aircraft including six Boeing 767-300s, which are used for long haul passenger services, Boeing 757s, Boeing 737-700s, Boeing 737-260, some Fokker 50s, while three DHC Twin Otters fly domestic routes. Ethiopian Airlines Boeing 767: Click to Enlarge. Regassa says that because of its modernization strategies, the airline has placed an order for ten Boeing 787 aircraft which will make Ethiopia Airlines the second airline in the world to purchase this kind of aircraft. "Ethiopian airlines continues to upgrade its aircraft to meet market demand and to generally improve its service," she says. 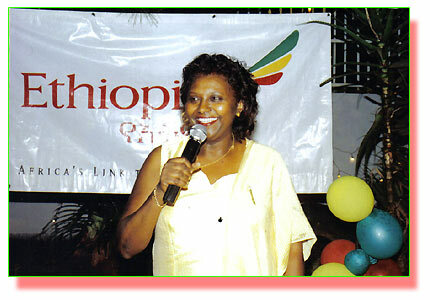 Ethiopian Airlines' area manager for Uganda, Ermejachew Regassa makes a speech at the company's 60th anniversary. Ethiopia airlines started as a local airline company in 1946 and a year later� started flying outside Ethiopia's boarders, first within Africa, then Europe, Asia and later the United States. "Our first international flight was Addis Ababa - Cairo in 1947 and then addis Ababa - Nairobi in the same year. We have been flying to Entebbe, Uganda for last 40 years. We are truly one of the pioneers of African aviation," says Regassa. The airline now flies to over fifty destinations, most of them in Africa. Today, the airline flies from its home in Addis Ababa to Dire Dawa, Djibouti, Hargeisa, Entebbe, Nairobi, Khartoum, Juba, Bujumbura, Dar-es-salaam, Kilimanjaro and Kigali in Central Africa. In southern Africa, it has flights to Harare, Johannesburg, Luanda, Lilongwe, Lusaka and N'djamena while in West Africa it goes through Abidjan, Accra, Bamako, Brazzaville, Kinshasa, Dakar, Lome, Lagos and Libreville. Outside the African continent, Ethiopian Airlines now flies to Dubai, Jeddah, Beirut, Cairo and Tel Aviv in the Middle East, New Delhi and Mumbai in South Asia, Amsterdam, Brussels, Frankfurt, London, Paris, Rome and Stockholm in Europe. In the Far East, Ethiopia Airline has routes to Beijing, Bangkok, Hong Kong and Guangzhou while in North America it flies to Washington, DC. "Our plan is to expand wherever there is a market. That plan continues," says Regassa. Regassa contends that the airline, which has until the past few years been carrying about 1.5 million passengers a year, had by 2006 reached the 2 million passengers-a-year mark. She attributes this partly to the increasing number of flights per week and the improvement in the services offered to their customers. "We started with two (flights) and grew to three then four per week and currently, we have daily flights from Entebbe to Addis Ababa where a fast route connection exists," Regassa explained at the airline office in Kampala. Regassa projects that by 2010, Ethiopian Airlines shall be carrying somewhere in the region of three million people per year and that the airline market will still be centered in Africa because there is a lot of potential. "Our vision has and still remains bringing Africa together and the rest of the world closer. We want to be Africa's world class airline by 2010," she says, adding that the airline is preparing itself to accomplish that strategic plan and is sure of doing just that. "The fleet is flexible, cost effective and maximizes passenger comfort and safety. We know that a satisfied customer is one who wants to travel with us always. We usually have people who continuously fly with us," explains Regassa. To achieve this, Regassa says, Ethiopian Airlines� has been focusing on service improvement including adapting to the ever-advancing technological innovations as well as focusing on the safety of its passengers. To meet its safety goals, the airline operates a test cell unit which measures the safety of all aircraft after the servicing of the aircraft, making Ethiopia Airlines one of the safest in the world. It is no wonder that Ethiopia Airlines recently passed the International Air Transport Association IATA Operation Safety Audit (IOSA) and was awarded an IOSA certificate� for passenger safety. By getting the certificate, Ethiopia Airlines became one of the only five Sub-Saharan Africa carriers to have successfully passed the IOSA audit. The Chief Executive of Ethiopian Airlines, Ato Girma Wake says, "The IOSA registration is another indication that Ethiopia Airlines ranks among the world's best airlines." To keep up with technological advancement in the face of today's very dynamic aviation industry, Ethiopia airlines had by the end of 2006 started offering online (internet) booking and electronic ticketing services to all its destinations. "The expansion of these innovative services to all Ethiopian Airlines' routes will provide our customers with greater convenience through s implified and fast booking, ticketing and check-in," reads a statement dated April 17, 2007 in part. 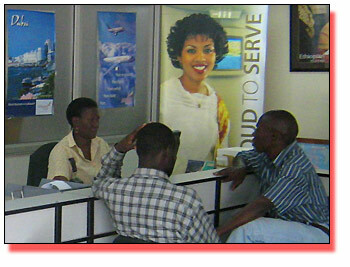 Customers at Ethiopian Airlines' Kampala office. According to the statement obtained from the Kampala area office, electronic ticketing allows Ethiopian Airlines passengers a seamless travel experience when connecting to its many interline partners. Regassa says that to promote the online booking service, Ethiopian Airlines introduced a 5 percent discount for customers booking online at www.ethiopianairlines.com. Regassa says that the feed back indicates that Ethiopian Airlines' customers are satisfied. "We give maximum care when handling passengers. According to passenger feedback, they like our hospitality from ticketing to in-flight service," she says. While aboard Ethiopian Airlines, you do not have a reason to get bored or feel the length of the journey. Documentary films about wildlife in Ethiopian Airlines' destinations, modern films and films about Ethiopian airlines all make the journey an enjoyable experience. "Many of our clients are business people who want to know where to go for shopping or what to expect at their destination and that is what we provide," says the airline chief in Uganda. There are two classes of services on Ethiopian Airlines - the Cloud 9 and the Economy class. Cloud 9 is a combination of the traditional first class and the business class. For those who want maximum satisfaction when they have some extra to pay for comfort, this is the class to go for. If your wallet is not so heavy, you can fly Economy Class. The service here is still good yet the price is much more affordable. 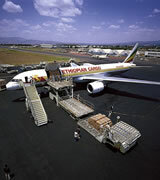 The other unique feature about Ethiopian Airlines is that it does not only provide passenger and cargo transport services but also trains pilots, technicians, mechanics and the like for other airline companies at its Addis Ababa training unit. Like Regassa says, Ethiopian Airlines has progressed thus far since it was started in the 1940s thanks to proper planning. For example the acquisition of the Boeing Dream liner 787 by 2008 will be one way of making the airline one of the most advanced on the planet so that it continues turning more miles into more smiles.